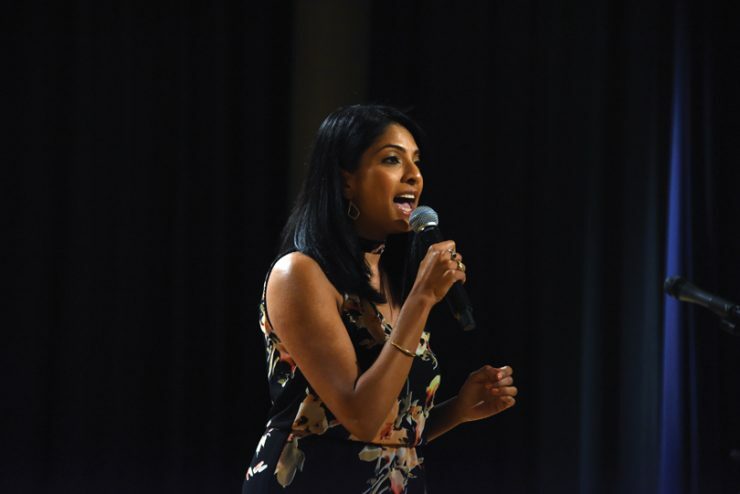 DCG students, faculty and alumni performed original songs, dance numbers and a little roasting of beloved faculty during the DCG’s 2018 Talent Show. The annual show, sponsored by the American Student Dental Association, was held Feb. 28. The DCG launched a video holiday greeting this year featuring musically talented dental students. Students were chosen to produce the greeting after submitting a brief audition video performing a holiday classic. Those selected to be featured on the video were Ben Alverson, Komlan Medeousso, Luke Robert and Luke Thompson, all members of the Class of 2020, and Kurt Hofius (’19) on piano. Even while studying for final exams, they squeezed in time to record their rendition of “Let it Snow” (https://www.youtube.com/watch?v=C0NQPzxzGMg&feature=youtu.be). Rhonda Banks, formerly director of annual giving at Augusta University, has succeeded Dale Crail to oversee development efforts for the DCG. Crail, who held the position for approximately 20 years, retired this spring. Banks joined AU in 2011, overseeing alumni relations and annual giving before being named director of annual giving in 2015. She earned a bachelor’s degree in administration from AU and a master’s degree in business administration from Georgia Southern University. She received AU’s Young Alumna Award in 2008 and the 2009 Young Professionals of Augusta Board Member of the Year Award. 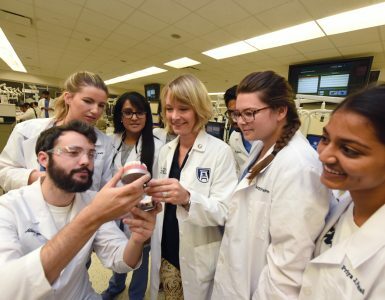 Dr. Carole Hanes, Associate Dean of Students, Admissions and Alumni, oversaw a special presentation recently for two future dental students. Vlad Cobzaru and Lara Way, who were among 708 applicants for DCG’s 96 first-year slots, were officially accepted on Dec. 1. Cobzaru, who is from Lasi, Romania, recently completed his senior year at Augusta University as a forward on the men’s basketball team. Way, a native of Martinez, Georgia, recently completed her senior year at AU as a member of the cross country and track and field teams. They are the first student athletes from Augusta University to complete their athletic eligibility and be accepted to dental school. 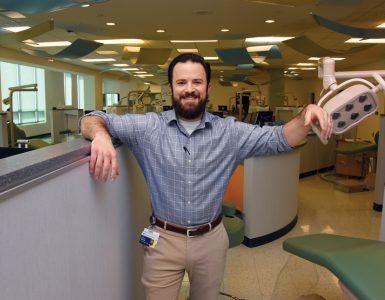 Dr. Eladio DeLeon has been named the orthodontic commissioner to the Commission on Dental Accreditation by the American Association of Orthodontists. His four-year term begins in fall 2019. The selection letter of DeLeon, who chairs the DCG Department of Orthodontics, cited his unique qualifications based on his years of American Board of Orthodontics consulting and examiner experience, as well as his many years as an educator. 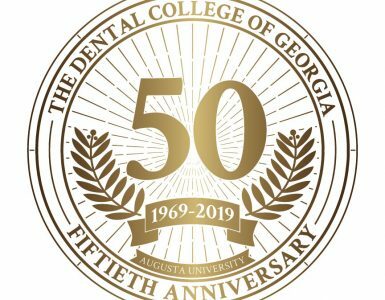 Five DCG alumni and one faculty member have been inducted into the International College of Dentists. Fellowship is extended by invitation only. Nominees must pass a rigorous peer-review process leading to the recognition of “outstanding professional achievement, meritorious service and dedication to the continued progress of dentistry for the benefit of humankind.” The newly inducted fellows are Drs. Rico Short (’99), Victor van Greuningen (‘02), Kevin Frazier (faculty), Ryan Vaughn(’07), Kristina (Mohme) Dawson (’12) and David Settel (’07). DCG General Practice Residency alumni inducted into the ICD were Drs. Andrea Company (’10) and Misha Ghazarian (’12). Settel also completed his GPR advanced training at DCG in 2008. Dr. Frank Tay, chairman of the Department of Endodontics, has been named a Chang Jiang Scholar, China’s most prestigious scholarly honor, in recognition of his research achievements in the mechanism of collagen intrafibrillar mineralization. The award is granted by the Chinese Ministry of Education to acknowledge special contributions made by Chinese scientists and international scholars in various research fields. Drs. Andrew Hamilton, Jane Martone and Mike Pruett have been inducted as fellows of the American College of Dentists. Fellowship is intended to elevate the standards of dentistry, encourage graduate study, honor meritorious work and provide community role models. Fellowship reinforces the highest ideals of dentistry.